RetroPie-Setup is a shell script to setup the Raspberry Pi with several emulators, various cores, and EmulationStation as graphical front end (It also can be installed on a PC running Ubuntu and has some support for the Odroid C1). Bootable pre-made images are available from https://retropie.org.uk/ for those that want a ready to go system. I am one of the main developers working on RetroPie and work alongside other contributors, who help with the code, graphics, documentation, and tutorials. The project also has a very helpful user base helping out over at the RetroPie forum, as well as contributing to the Wiki. On October 30th 2012, Pimoroni launched a Kickstarter campaign for the Picade – a small table top arcade cabinet for a Raspberry Pi (or other small computer/board). 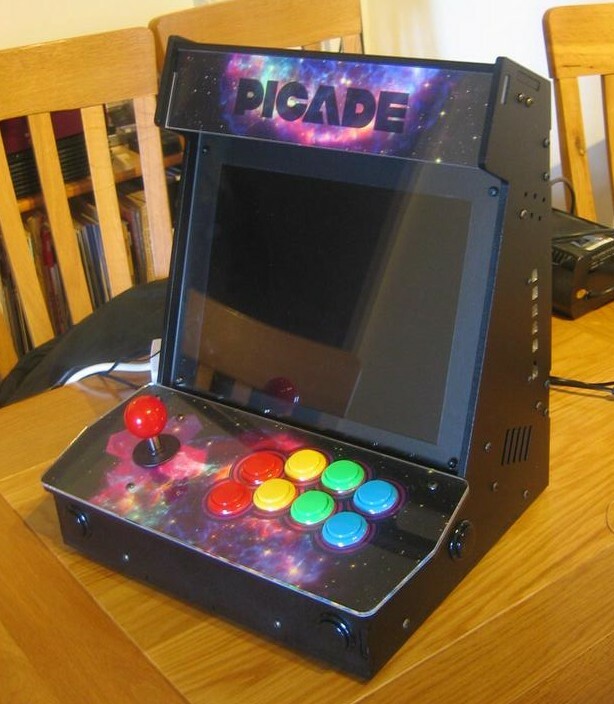 In June 2014 I received my Picade, installed a Raspberry Pi in it. I had previously looked around at available software and had come across the RetroPie project, which was an automated set of scripts to pull together an easy to use emulation system on top of Raspbian. Just wanted to drop in and say thank you for all the continued updates to retropie. Thank you tremendously for all your contributions to the RetroPie project. thousands (tens of thousands?) of people are enjoying experiences from their past because of you. Love RetroPie and thanks a ton for all your work. Just testing out V4.1 and it’s been brilliant. Wow RetroPie is amazing. Best part is I no longer have to hunt for physical copies of various systems. No idea what to call this, not a complaint, but a personal….issue with rpi. Will look elsewhere more fitting to post the following- running rpie on ubuntu 16 lts, and after fighting physical conections from laptop to tv, was ready to play on the big screen. Menu is good and works in mirror screen setting. Problem deals with launching a game. On the laptop screen everything is great, on the tv tge game isn’t full screen and behind it has a terminal background that flickers. Actually i’d compare it to strobe. No clue on what command to enter and searching the internets results in nothing. Results are about rasbery Pi or flashing screen of the OS itself, nothing about rpie itself. Would attempt to uninstall and reinstall, attempted both through terminal and in app page. Won’t uninstall. Also might be defined as personal. Using a xbox 360 controller, unable to use left joystick as i would the dpad. Still fail to get over that rpie does so much.